As my five year wedding anniversary approaches, I’m reminded of a film that was a big inspiration to me in the planning of my nuptials. Namely, it was an inspiration of the kind of wedding I didn’t want. No big hair, or behemoth dresses, or tacky reception halls, or drunken best man speeches for me and my beloved (though the orchestral version of Journey’s “Don’t Stop Believin” did make an appearance during my aisle walk, in steel drum form). The film I referenced was that classic homage to the 1980’s, The Wedding Singer (DVD/Download). I like to watch this every year in the spring as wedding season rolls around, to remind me of how lucky I am that I didn’t get married in the 80’s. Shoulder pads and perms- oh the horror! The Wedding Singer is a sweet movie starring Adam Sandler and Drew Barrymore as two people who are unfortunately saddled with fiancés that are totally wrong for both of them. He’s a wedding singer, she’s a waitress, and they meet cute at a catered event as Alexis Arquette covers Boy George songs and pre-teen boys drink too many rum-and-cokes. Sandler and Barrymore are absolutely adorable together, and the script is chock full of hilarious 80’s references. 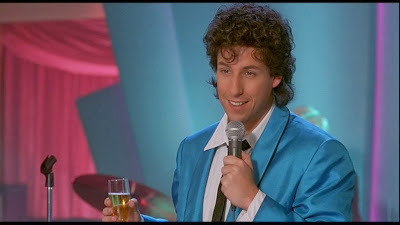 I never really cared for Adam Sandler before this movie, but in The Wedding Singer, he proved that he can be funny and heartfelt (and that he can totally rock a permed mullet). Supporting roles played by Christine Taylor, Jon Lovitz, and the always amazing Steve Buscemi add to the comedic scenes, and even Billy Idol makes a cameo toward the end. If you’re a fan of 80’s nostalgia and romantic comedies, trust me, this is your movie. My drink this week was inspired by #1 Miami Vice fan Glenn Guglia, Drew Barrymore’s fiancé. Glenn is your typical 80’s smarmy frat boy/stock broker type, and his drink of choice is the classic 80’s cocktail, the Alabama Slammer. It’s sweet, boozy, it’s empty of anything substantial- it’s the 1980’s in a glass. Add all the ingredients into a shaker filled with ice. Give it your best Tom Cruise-in-Cocktail shake, then strain into a highball glass filled with ice. 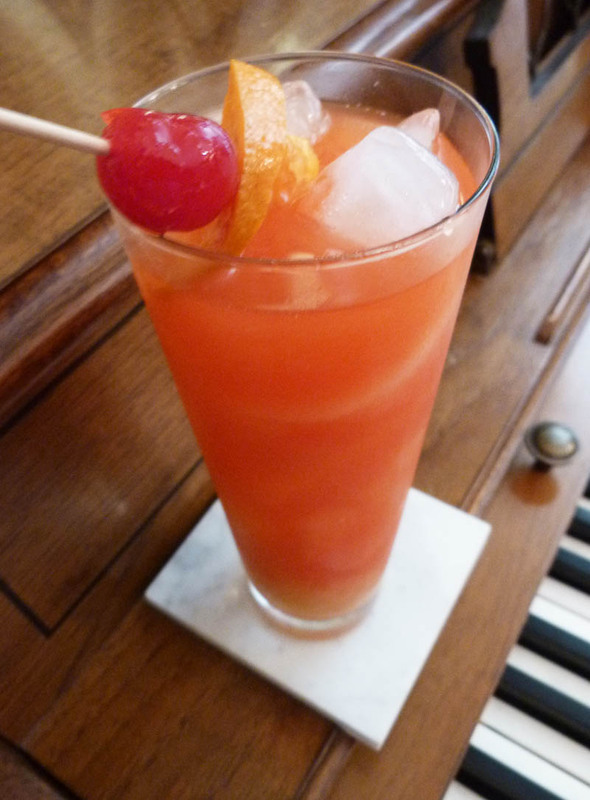 Garnish with orange wheel and cherry. My advice to you on this one- watch your alcohol consumption closely because you don’t want to end up like Julia Guglia, climbing into a Delorean with vomit in your hair. Adam Sandler and Drew Barrymore would go on to make many more movies together over the years, but this one is by far my favorite. The soundtrack is great, and I dare you not to be humming “Do You Really Want to Hurt Me” long after it ends. Just be careful of “Ladies Night”- Jon Lovitz has a tendency to get into my head and never leave. Cheers! Posted in Comedies and tagged 1980's cocktail, Adam Sandler, Alabama Slammer cocktail recipe, Christine Taylor, Drew Barrymore, Jon Lovitz, Julia Guglia, Steve Buscemi, The Wedding Singer, Wedding Cocktail. Bookmark the permalink.